Juventino Aranda, “The West Will Never Win and I Will Not Concede (Rainier),” 2016, Pendleton wool, bronze, oil stick, 66 x 81 1/4"
Art that depends heavily upon communicating political resistance runs a risk of becoming scolding or hortatory and thus turning us off. In an auspicious solo gallery debut, Juventino Aranda, a young (age 32) Chicano artist who lives in Walla Walla, Washington, treads a fine line between beautiful, elegantly humorous sculptures and the angry artist of statements and interviews. All that is well and good, but what if the art fails to be as explicit as the artist might wish? And who is the art more aimed at, its viewing audience or the target subject? The refreshing mixture of materials here — photographs, paint, found objects and fiber — often leads to objects that parody paintings or sculptures of mainstream modern art, but with elements switched out to make social or political points. Deeper readings of injustice or prejudice toward Latino people are subtly present, but not obvious, nor entirely necessary to see in order to appreciate their formal meaning or skillful construction. For example, in the most blatant example, swaths of multi-colored striped Pendleton blankets replace parts of a painting that echoes a Mark Rothko “cloud” painting. Thus, looking more like an ethnic textile than either an Abstract Expressionist masterpiece or a vintage Pendleton, “Above and Beyond with Reasonable Doubt (Grand Canyon)” is a loaded work weighed down by its loaded, cumbersome title (all the titles are too long). When we reflect how much of 20th-century Mexican art was heavily social or political in content, it makes sense that Aranda jams the two poles — politics and formalism — into newer expressions. 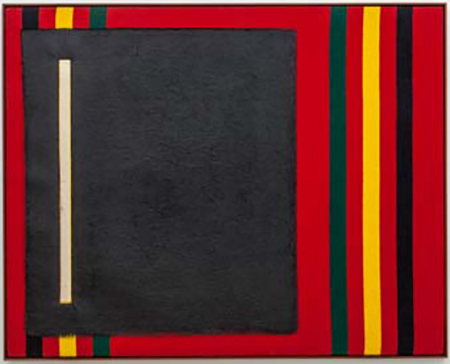 Similarly, “The West Will Never Win and I Will Not Concede (Rainier)” sounds like a mouthful of resistance propaganda, but resembles a rectangular Barnett Newman; in fact, it is a rhetorical take-off on his iconic masterpiece “Vir Heroicus Sublimis” (1950-51). In Aranda’s hands, the celebrated Newman “zips,” or vertical stripes become the bars of a jail cell. The Pendletons, as they are used by Aranda, are loaded symbols. A clue in “Guess Who’s Coming to Dinner (The Chickens Have Come Home to Roost)” is the placement of a white-trash gingham tablecloth laid over a “Pendleton serape,” distantly alluding to the predominantly Latino workforce at the company’s blanket factories in southwest Washington and northwest Oregon. More succinct is “Fin (The End of the Line),” in which Aranda uses a gilded railroad tie to suspend another serape, which hangs like a limp bathroom towel. It could be that, without wishing to, his felicitous, gentle warnings about injustice toward Mexican-Americans will become sadly prophetic, given the election promises and threats of Donald J. Trump, whose absurd red baseball cap with the single word “GREAT” Aranda has cast in bronze. The deaths of Chicano-American soldiers in various misbegotten American foreign entanglements is brilliantly evoked in “Lay Me Down in a Bed of Roses (When I’m Gone),” a cotton shroud exactly of U.S. military burial flag dimensions. White on white, the insignia of the flag of Mexico is machine-embroidered in the center. American enough to die, but not enough to be treated equally. Again, the work is formal like a proper abstract painting; it could be mistaken at a distance for a Robert Ryman or Agnes Martin original. Another artist, Jasper Johns, is nodded to, or appropriated — Aranda’s uniting trope throughout — in “Don’t Let My Glad Expression Give You the Wrong Impression (After Jasper Johns).” Nailed to the wall, and with a tattered fringe at its base, a gingham tablecloth replaces the field of state stars. Endangered and damaged, America’s symbol is slowly unraveling. Aranda’s most outrageous appropriation — and most successful — is of Leonardo da Vinci’s “Last Supper” (1495-98). “Every Time I See ‘Em Somthin’ Wrong with They Memory (Got a Lotta Enemies)” is the most prolix title. The peeling fresco in Milan summons up worlds of implications: betrayal, dinner gatherings, brotherhoods and fugitive art materials. Sealed onto plaster with metal and wood appurtenances, a portal underneath the table is an arched entryway, underscored by a wide red line below. Ambiguous, powerful and open-ended, the assemblage also evokes the Roman Catholic Church which, given its historical complicity in oppressing indigenous peoples, could be behind it all. Aranda has more ideas than he can encompass in one show, but what a beginning! In the coming years, I know he will be at the forefront of an art of conscience that aesthetically explores history, values and governance in relation to beleaguered minority populations.